I have previously sung the glories of Mexican street food. But Mexican street food isn’t limited to brilliantly flavorful versions of traditional antijitos. It’s not all down-and-dirty stuff you might see on Bizarre Foods, with its implicit (if somewhat patronizing) suggestion of “indigenousness.” Mexican street food is something of a culinary laboratory. If, as Anthony Bourdain claimed, Ensenada’s Mariscos La Guerrerense is “the best street cart in the world,” then perhaps Tacos Kokopelli (Calle Ocampo at Blvd. Agua Caliente) is the best street cart in Tijuana. Tacos Kokopelli—opened in 2012 by Guillermo “Oso” Campos Moreno (a Culinary Art School graduate with experience at Michelin three-star Oud Sluis restaurant in the Netherlands and as executive chef at the Parque Bicentario in Guanajuato, Mexico), his brother Pablo and Orlando del Monte—immediately made a splash on the Tijuana culinary scene. The Kraken, Kokopelli’s signature dish, is a taco of mesquite-grilled octopus with a Mexican “pesto” (poblano chiles and cilantro). Like many of Kokopelli’s dishes, the Kraken is at its best topped with pink onion and habanero pickle and an addictive sauce of roasted chiles with toasted peanuts in oil. This marvelous affair managed to speak of earth (poblano), air (smoke) and sea (octopus) while also having a meaty feel. Another Kokopelli original is the Black Harder, a tostada with ceviche of lenguado (sole) marinated in lime juice and squid ink and served on a salsa of tomatoes, chile and squash with cilantro and avocado. Already a textural playground with its contrast of the crisp tostada, soft sole and supple salsa, it gets another dimension from the pink pickled onions. It’s also beautiful, with the black lenguado playing off the red salsa, the green cilantro and avocado and the pink onion. On multiple trips to Kokopelli, I’ve yet to find a dish that’s less than extremely enjoyable and at least a bit surprising. “Vegetarian” and “Mexican street food” are hardly synonymous, but Kokopelli’s “Funky”—a taco of Portobello mushrooms and spinach with a goat cheese and red wine sauce—was a particularly surprising find, with the fresh spinach elevating the whole thing. But it was one of Kokopelli’s “Experimentales” that went over the top. 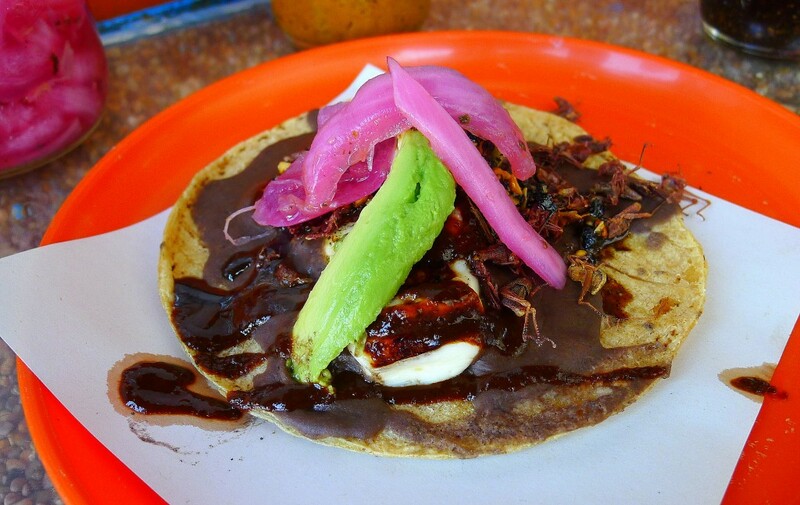 The Fin del Mundo taco (“end of the world”) features grilled panella cheese over puréed black beans, a sauce made frompulque (the first fermented step on the road from cactus to tequila) and chapulines. If you don’t know what chapulines are, you probably don’t want to know: grasshoppers. Yes. Bugs. Nicely seasoned bugs, mind you, with salt, lime and a very pleasant crunch. The only thing off-putting about them is the idea, and flavor overcomes that with ease. From the warm comfort of the cheese and beans to the out-there idea of the chapulines and the pulque tying it all together, this was a dish that was far greater than the sum of its parts.